On Saturday July 03rd 2010 we were at Shakespeare’s Restaurant and Pub in Ellwood City Pennsylvania. The event was a wedding reception for Chad and Leah Conti. Leah and Chad were married at 3:00 pm at the Hope Evangelical Lutheran Church in Cranberry Township Pennsylvania. Guests began arriving at Shakespeare’s Restaurant and Pub at 4:30 pm where they enjoyed cocktails and appetizers. Chad, Leah and the bridal party arrived at Shakespeare’s around 5:00 pm where they posed for photographs with Paul Meyer of Paul Meyer Photography. Paul and his wife Cindy are absolutely great people to work with and are incredible wedding photographers. Paul even shared some tips with us on how to improve the lighting on the photographs that we take at events. 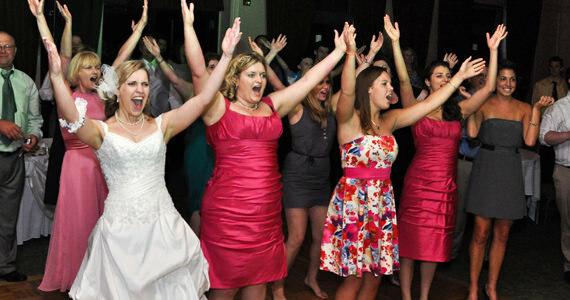 At 5:30 pm we formally introduced the bridal party to the song “Bring Em Out” by T I. 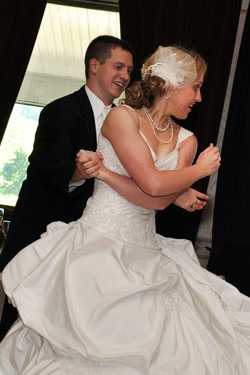 After the introductions, Chad and Leah shared in their first dance together as husband and wife to the song “You’re The First, The Last, My Everything” by Barry White. 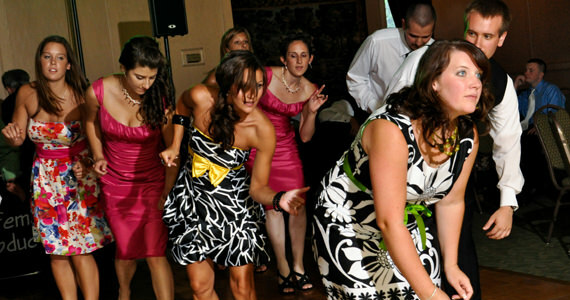 Chad and Leah had taken dance lessons in preparation for their wedding and it definitely was a success. They danced a well choreographed routine and the guests loved it. Chad and Leah then cut their wedding cake to the song “I Can’t Help Myself (Sugar Pie, Honey Bunch)” by The Four Tops. Dinner was prepared by the culinary staff at Shakespeare’s Restaurant and Pub and was served sit-down style. After dinner, Leah had requested a special dance with her father Mr. Tim Reddinger to “My Girl” by The Temptations. Chad then danced with his mother Mrs. Ursula Conti to “You Are The Sunshine Of My Life” by Stevie Wonder. Throughout the remainder of the evening, guests danced to music by Bon Jovi, Michael Jackson, Timbaland, Tone Loc and more. At 10:00 pm we invited all of the guests to share in the last dance of the evening to “The Last Dance” by Frank Sinatra. 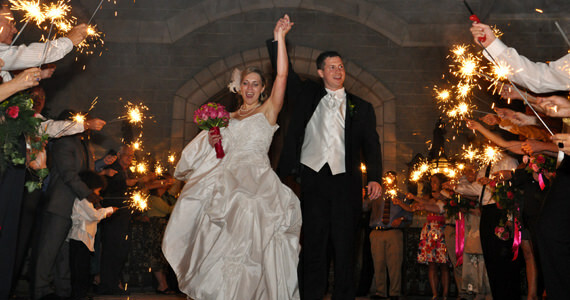 After the last dance, everyone proceeded outside to participate in a sparkler send-off for the bride and groom.